There were winners all over yesterday. 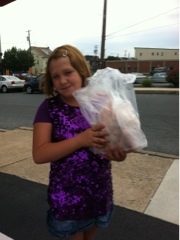 At the farmers market in New Cumberland a prize was awarded to one of the youngest market shoppers: a chicken from Sunnyside Farm! The Scavenger Hunt for York Buy Fresh Buy Local had the final event yesterday: a wrap up party at John Wright Restaurant. There were 30+ stops on the scavenger hunt. Farms, wineries, apiaries, bakeries, restaurants, orchards...all over York County. Which, if you visited every spot, was a lot of driving. And apparently a lot of fun: almost one hundred people participated and traveled to John Wright to turn in their game card. More than a dozen visited every location on the list! The comment heard most, by all of us "I had no idea there was this much going on, right in my area!" It was true for me too, I had no idea there are that many places in York County to get great eats! Prizes were pulled and awarded. Gift baskets filled with goodies, gift certificates, tickets to future events. The grand prize, from Allegro Winery, was a party/tasting for a group of 20, at the winery! Others were for meals, honey, all good stuff. 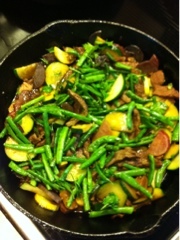 And on returning home, my dear husband had cooked up this, for us: a stir fry of food from the farm, beef and vegetables. So good it's for breakfast too. It feels like I'm the real winner!